SAN FRANCISCO, CA - OCTOBER 21: Singer James Hetfield of Metallica yells out "Let's Play Ball' before the San Francisco Giants take on the St. Louis Cardinals in Game Six of the National League Championship Series at AT&T Park on October 21, 2012 in San Francisco, California. It's Metallica Night at the ballpark tonight. Black and orange -- but mostly black. 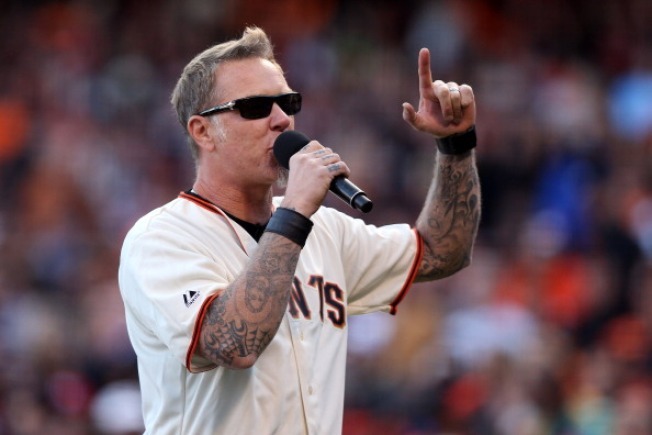 It's Metallica Night at the San Francisco Giants tonight -- which means metal. And the arch-rival Los Angeles Dodgers. And a special edition "METALLICA GIANTS HAT!" As well as "Metallica entertainment features throughout the game," according to the Giants. First pitch is 7:15 p.m., but beforehand, the band -- which started here in the Bay Area -- is scheduled to "be on-hand" for the National Anthem. The game will be aired on NBC Bay Area. Part of the proceeds from the game will be donated to the Bill Graham Foundation. Tickets for the metal fest at the ballpark are still available as of this writing. Tickets start at $69 for standing-room only. The ticket package includes a ticket to the game, as well as a collector's-edition hat. Los Angeles will send pitching ace Clayton Kershaw (3-2, 1.73 ERA) to the hill. It is his first start since taking bereavement leave following the unexpected death of his father this week. The Giants are sending Barry Zito to the mound for his fourth start of the season. Zito has pitched seven scoreless innings in each of the first three. Below is a video of pitcher Barry Zito jamming with the band.